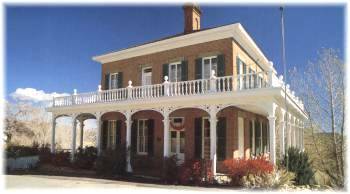 John Mackay's home still stands as a reminder of the opulent days of one of Virginia City's "Bonanza Kings". A generous man, most of his charities were anonymous, but his gifts to St. Mary's of the Mountains and to the Mackey School of Mines in Reno, are well known. At one time the mansion housed the Gould & Curry Mine Offices.